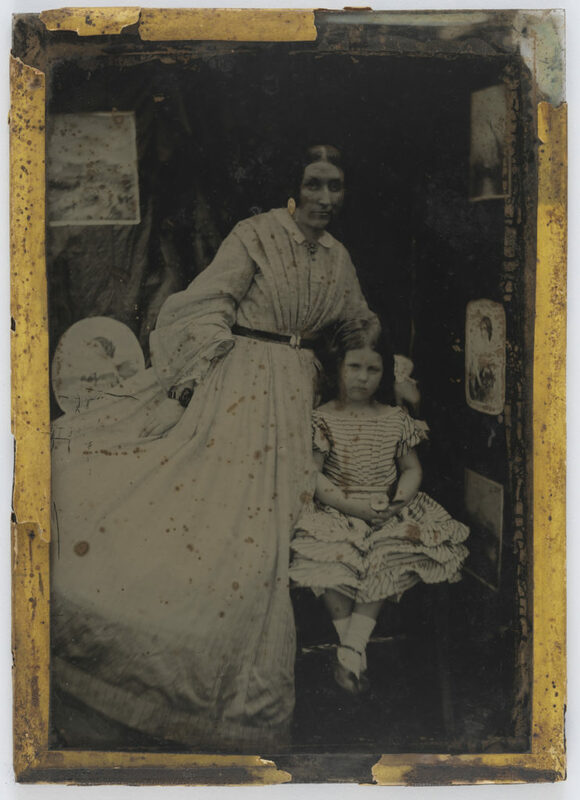 This full-length double portrait ambrotype photograph shows Sarah Cross Little, nee Bingle, aged 32, with her eldest daughter Mary Emma, aged about 4 years old. The image looks to have been created by an amateur photographer, possibly Joseph Docker, a close friend and next door neighbour of the Bingle family at Scone, NSW. The subjects are posed in a make-shift studio with a mock room setting comprising dark cloth ‘walls’ hung with scenic and portrait prints. It offers rare and early documentation of everyday informal dress as worn by female members of a rural colonial family. Mrs Little wears a day dress of finely-striped gauzy [cotton] fabric with a light-coloured ground, the high-necked bodice worn with a small white collar and a brooch, above the softly-pleated corsage concealing a front opening and fanning up to the fashionable low shoulder line from a round waist, marked by a narrow dark belt with a [metal] clip buckle, above the plain, gathered or pleated full skirt, supported by a hooped petticoat the outline of which clearly is visible above the hem. Her very wide, bell-shaped sleeves are in the style shown in fashion plates of the early 1860s, flaring from the upper arm into a large, bowed shape with tucks inside the elbow, worn over open puffed, flounced undersleeves above a bracelet (probably one of a pair) with a central medallion of a dark-coloured, open-work carved material (possibly jet). She wears her dark centre-parted hair in the popular ‘bandeau’ style –check. Mary Emma Little wears a summery day dress of horizontally-striped [cotton] with a wide shallow neckline, short double-ruffled cap sleeves with ribbon bow trim, the bodice with a loosely-pleated corsage above a round waist band and pleated or gathered short full skirt with triple bands of ruffled trim. She wears white ankle socks and ankle-strapped, round-toed, flat leather shoes trimmed at the throat of the vamp with silk floss pom-poms. Her clasped hands hold a white flower in her lap and she wears her centre-parted dark hair brushed into long, soft ringlets at the temple. Sarah Cross Little, nee Bingle (1832-1909) was the second daughter, and youngest of three children incl. John Rayden (b.1829) and Mary Elizabeth (b.1825), born to John Bingle (1796–1882), and his wife Mary, nee Cross, of ‘Puen Buen’ on the Upper Hunter River. In 1858, Sarah married William Little (1833-1882) and the couple had eight children, four of whom survived to adulthood including Mary Emma (b. 6 March 1860-1926) who later married Herbert Gardner and bore a family of 12 children, 7 surviving to adulthood. For two years after their marriage, Sarah and William lived at his father’s property, Belmont at North Richmond, NSW. When Francis Little died in 1860, as his eldest son, William inherited ‘Invermein’ station at Scone, NSW, where the family resided until William’s retirement in 1877. ‘The Honorable Joseph Docker of ‘Thornthwaite’, Scone, was a great friend of W. Little – also my father. The former used to spend three days every week at Puen Buen, drive (sic) down to attend the Courts in Scone’. During this period, between the years 1850 and 1855, Docker took several amateur featuring the Little and Bingle families and their properties which were collected and stored in albums (ML). After Joseph Docker became a Member of Parliament (MLC, 1851 to 1884) the family lived mainly in Sydney but still travelled frequently. Both Joseph Docker and his son Judge Ernest Brougham Docker (1842-1923) experimented with calotype and ambrotype (collodion positive) photography, modifying Docker’s camera obscura for calotype (salted prints on paper from glass negatives) photography in about 1850 – a early format of which Docker was one of the first in Australia to experiment. Ernest Docker was also took lessons from Sydney photographer William Hetzer and, in 1858 with his father, began experiments with a wet-plate process. Between 1860 and 1868 Docker was sensitizing his own dry plates by the tannin-collodion-albumen process, although dry plates were not widely used until the early 1880s. Joining the Royal Society of New South Wales in 1876, Ernest Docker did much to promote photography through his articles in overseas and Australian journals, particularly in the British Journal of Photography, and as president of the Photographic Society of New South Wales in 1894-1907.